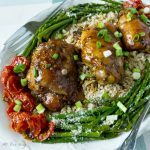 Chicken thighs are first marinated in a delicious honey, soy, garlic and ginger sauce and then they are finished in the oven resulting in meat that is moist and full of flavor. Mix the marinade ingredients together and then put in a zip-lock bag. Add the chicken and make sure that all the pieces are coated with the marinade. Place the chicken with the sauce in the refrigerator to marinate for at least 1 hour. When ready to cook, put the chicken in an oven proof baking dish or pan, in the preheated oven skin side up. Bake for 25 minutes, turn the chicken to cook skin side down for another 10 minutes. Again turn the chicken skin side up and finish for an additional 10 minutes. Cooking time will be approximately 45 minutes -- the internal temperature of the chicken should read 165 F.
The chicken can also be grilled.